1. Measure the 2×4”s in 4 13.5″ Sections long. 3. Once all the pieces are cut, nail them together into a square. 4. Take the piece of plywood and nail it to the bottom to create a base. 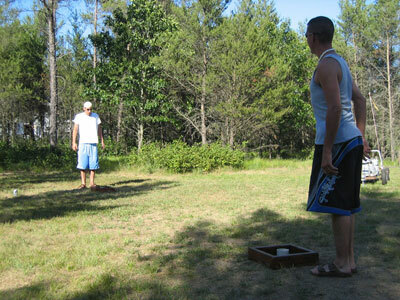 Set the 2 boxes on the grass, 10-12 feet apart. There are 2 teams of 2 people each. 1 Person from each team stands next to each box. (So you would be across from your team mate) Flip a coin or whatever to determine who goes first. First team throws the washers across at the box on the other side. After the first person goes, the other team has the opportunity to cancel out points. 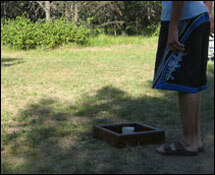 For example: team 1 goes first, they score 2 within a washer length and 1 in the box for a total of 5 points. Do not move the washers yet. Team 2, on that same side, throws his washers and gets 2 in the box and 1 out in nowhere land for a total of 6. This would mean that the score is 1 to 0 in favor of Team 2. Since they canceled out all of team 1’s points and had one left over. Simple enough. The Game is played to 21.